Continuing Education Director Sarah Llewellyn presents association business while President Paula Dieli looks on. The invited speaker at our February 11th NCTA General Meeting was here to help us keep our translating business running smoothly; to keep NCTA running smoothly, the meeting opened with reports from our Board and Officers. First of all, our Web site! It’s updated, and it’s gorgeous. The go-to place for info on our activities when questions pop into mind while tapping away at something else on the computer. Many, many thanks to Paula for the time she’s spent to provide this convenient resource. 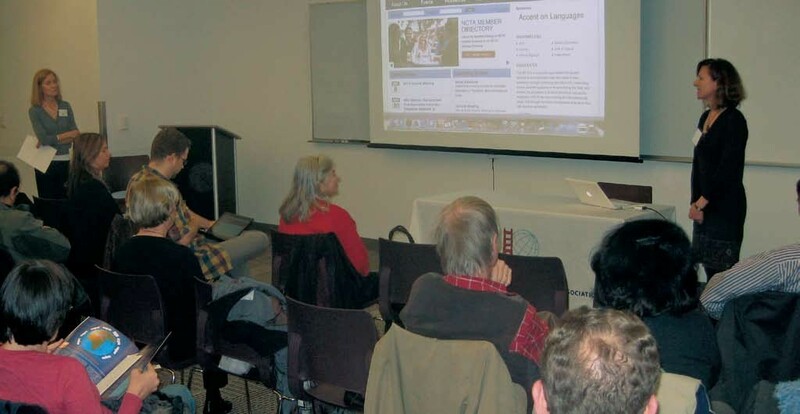 Kristen Corridan, our Events Coordinator, reminded us of the Happy Hours coming up, and Christine Lemor-Drake described the French dictation event the Dictée pour tous, sponsored by Apple to Pomme and NCTA at the SFSU campus on Saturday March 24. It was open to Francophones of all ages. Sarah Llewellyn, our Director of Continuing Education, acknowledged Paula’s work on the website and gave us a rundown of the upcoming workshops. NCTA President Paula Dieli then presented her Annual Report, including membership statistics, financials and social activities from the past year. Of note were a significant increase in Translorial subscriptions and continuing growth in participation of NCTA social media (LinkedIn and Facebook). Sonia Wichmann, our Vice-President, presented the results of our election—the first time for our online voting system—you can read them in this newsletter. Paula introduced the new members in attendance, some of whom had attended the new member orientation run by Kåle Lindahl, our Membership Coordinator, before the meeting began. Kristen Corridan introduced Karthik Raman, a Certified Information Systems Security Professional (CISSP) now with Adobe Systems. His presentation was aimed at helping us avoid the problems that most of us have experienced at one time or another. Somehow, he managed to nest security education in a friendly, occasionally humorous, and completely understandable presentation. To set the tone, he mentioned that aat least 58 new viruses affected Macs® in 2011, according to one study—you Mac® users thought you were safe! Karthik then introduced what he called the most “boring part” of the presentation: the fundamentals of computer security. He spent the remining time giving us just the right amount of detail to keep our data (and our tempers) under control. Accessing Internet sites: the first line of defense is to use the latest version of a modern browser and be aware of the security defaults it offers. Type in the URL for your bank, look for the lock icon and the https that denote a secure site. And, of course, install good antivirus software that will help you avoid malware, and keep it updated. Passwords: those combinations of upper- and lower-case letters, symbols, and numbers that can’t be easily figured out (especially by us)! Don’t use simple passwords, change them often, don’t reuse them, and stay away from networks that aren’t password-protected. Protect your home-office router with a password. Karthik mentioned programs that store passwords securely and enter them without our retyping. Data loss: we have seen the enemy and it is us! Common errors include not making backups, not being able to retrieve backups we’ve made, and backing up the wrong data. Incremental backups are at least part of the solution here, and the best practice is to use a combination of cloud and disk backups! Accounts: Another important precaution to protect sensitive client data is having a non-administrator account with a different password for critical tasks. The best practice is to keep work and personal data under separate users. Karthik opened the meeting to questions from attendees. One of the issues of frequent concern is using web sites from other countries, and arranging international transfer of payments. He pointed out that there is little difference between security in the national and international spheres; proper security procedures are valid worldwide. But then, how does the translator differentiate between real and fake job requests? This is an issue that comes up frequently on the NCTA listserv, as well as other professional listservs. Here, Karthik reemphasized what has been said previously: check your mail settings and set your spam filter to exclude emails in different character sets; scan attachments carefully; and get a sense of the context. Asked about free antivirus programs, he mentioned Microsoft Security Essentials for Windows, while insisting that it’s important to have a “layered defense.” Karthik also informed us that Trojans are rising as threats to Macs®. In this case, the user has to actually install a program. mimi posted this article under NCTA Meetings	on Tuesday, May 1st, 2012 at 12:04 pm	You can follow any responses to this entry through the RSS 2.0 feed. Both comments and pings are currently closed.